In the last few blogs I've argued the case for Lewisham Junction, the development of a major new rail interchange for South East London, backed by regeneration of Lewisham. This blog looks at how the DLR interacts with the site. The Lewisham Junction proposal faces an immediate peoblem in that it acts as less of a junction than the current Lewisham (North) station. This is expected and is the trade off between the inability to further expand the existing site and building a new junction from scratch. Key to making the new junction work is the DLR. The first DLR extension would need to be from Lewisham (North) to Lewisham Junction. This would almost certainly be in addition to the existing railway line that runs to Hayes. This extension would be essential to the viability of the station as a junction, especially for connections to Canary Wharf and Stratford. There has also been talk of extending the DLR, to Catford separate to this proposal. Having been to Ladywell, I'm uncertain as to how that would happen without closing the Hayes line north of Catford. Now this may be a longer term option, but doesn't seem likely now. Instead, I want to focus on a different DLR extension - from Woolwich. It isn't always appreciated that the DLR station in Woolwich faces west, rather than south. As such, the most logical direction for extension is to the west. This proposal would extend the DLR from Woolwich to the new Lewisham Junction station. There would seem to be two main approaches. The first approach (in purple/red) would see a new tunnel of 2.2 miles from Woolwich to Charlton, probably via the B210 Artillery Place/Hillreach. From there, it would take over the Charlton to Blackheath line from Network Rail, potentially adding a new station by opening up the tunnel near Old Dover Road. From Blackheath to Lewisham Junction, the DLR would then run on the surface alongside or above the existing line to Lewisham before turning to Lewisham Junction. This last section could also be tunnelled. 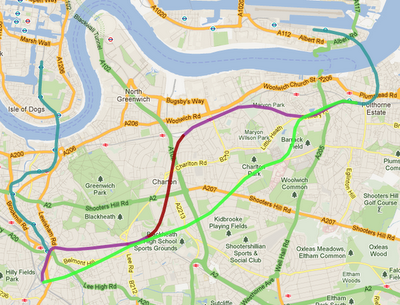 The second approach (in green) is to tunnel the whole way, running via Blackheath, but not via Charlton. This approach would allow new areas to be served that are currently remote from rail public transport. The amount of tunnelling is of the order of 4.5 miles. Note that the tunnel length is only twice that of the first approach. The key benefits of these two DLR extensions is a major boost to public transport connectivity in the area. Lewisham Junction would have direct services to both Canary Wharf and City airport, as well as boosting regeneration in Woolwich. The Lewisham Junction proposal cannot work without extending the Lewisham DLR branch to the site. However, the site really starts to work if the Woolwich DLR line is extended to Lewisham Junction as well. i would wonder just how many people would use the Woolwich DLR option. However, there are tons of buses going between Catford and Lewisham, and I definitely think that route warrants a DLR extension. The line to Hayes isn't that convenient as it sits about 1/2 mile to the west of the main road. I would favour a DLR extension on stilts right past the Lewisham Hospital down to Catford. Also, cross connectivity between "towns" in SE London is poor. Try getting travelling between Forest Hill, Bromley and Lewisham in one afternoon. Quickest way is by car/bike. I suspect that a DLR extension on stilts down the main road would be too controversial, although I agree that it may be a better route and busy with buses. Part of the goal of the DLR from Woolwich is to increase the local connectivity you talk about. Another route option would be fully tunnelled via Kidbrooke, which would open up even more areas without rail public transport. Funnily enough my last post in this series will aid journeys like Forest Hill - Bromley - Lewisham. A new Lewisham Junction would be really good news. I travel up on the main line from Sevenoaks and it is frustrating to sit on the train going past the existing Lewisham station. Along with hundreds of others I must go to London Bridge and add to the very long queues for the very full Jubilee line to Canary Wharf. I have had a lot of time to reflect on why the original DLR "missed" the main line and an important potential source of passengers by a few hundred yards. Thanks for a fascinating series of posts. Never thought about Woolwich extension - issue with proposed tunnel is lack of regeneration benefits. The proposed (and now dead) greenwich waterfront transit was supposed to pooter down Woolwich road and open up the waterfront industrial estate for new development. Would either need an underground DLR station there or, to minimise cost, get remodel the crappy road and have it surface running with station. I certainly think it would be possible to route from Woolwich to Charlton closer to the Thames to open up a regeneration area. After all, the DLR is the "regeneration railway".